September is National Potato Month. As such, I thought it would be fun to celebrate with a bunch of potato recipes. The other day, for example, I posted a yummy potato soup recipe. I also wanted to feature a potato candy recipe because I remembered making some with my mom one time, but it wasn’t the roll-out-the-log kind of potato candy that you can find hundreds of recipes of online. Her potato candy recipe was easier than that (or so I thought) – just mix all the ingredients together and roll them into little balls that you coat with powdered (confectioner’s) sugar. Well, I tried to do it from memory, and…it was a big, fat FAIL! I could NOT replicate my mom’s potato candy balls. Since I came out with a big, sticky, ooey-gooey mess, I tried to make something of it by adding flour and baking powder and sticking it in the microwave. The result? A deliciously rich, thick cake that’s great for breakfast or snack time. No need to ice this baby. It’s perfect as is (the confectioner’s sugar is inside the mix, remember). Thankfully, I was able to turn a near-food tragedy into a delicious food WIN! But I guess I’ll need to bug my mom to give me her potato candy recipe so I can see where I went wrong with that. 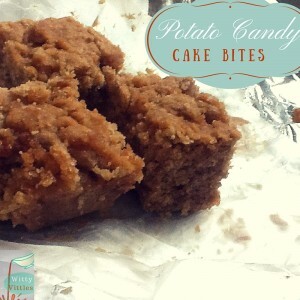 However, today I bring you what I affectionately call Potato Candy Cake Bites. Yum! Here’s a fun new twist on an old favorite, potato candy! In a large bowl, mix together cooked instant mashed potatoes, peanut butter, confectioner’s sugar, and spices. Add flour and baking powder, and stir until combined. Mixture will be slightly thick. Grease an 8 X 11-inch Pyrex baking pan. Spoon potato candy batter into the greased pan. Cook in the microwave on medium (Power Level 5) for 10 minutes. Rotate once in the middle of cooking, if you don’t have a turntable (or, if your microwave is small like mine, and the baking pan gets stuck so the turntable can’t move). Microwave on high 4-6 minutes. Check the cake carefully at this stage. Cut into 24 smallish squares to serve. These cake pieces are very thick! I was pleasantly surprised by how well these little gems turned out (especially considering how disappointed I was when the potato candy didn’t turn out the way I thought it would). These things are super-filling, but super-delicious! My whole family loves them, and I hope yours does too!